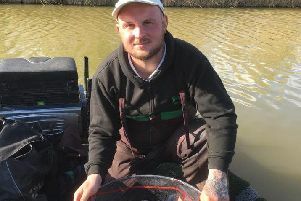 A cold cross-wind made life difficult for Webb’s AC anglers fishing Lake Ross at the weekend. Out in front with a net of carp to four pounds was Martin Delegate, who fished the feeder with banded pellet to finish with 38lb 15oz. Similar tactics gave Andy Matthews second spot on 38lb 5oz, then came Mick Wright with 30lb 3oz. In a recent Tuesday Club match on Bevills Leam at Carrot Wash, Stanground rod Frank Bevilacqua took a fine net of tench and bream to top the field with 27lb 8oz. He caught on red maggot over worm. Runner-up with 15lb 5oz was Mike Smith then it was Mike Mohan with 5lb 4oz followed by Roger Biddle on 4lb 13oz. On Saturday, Mike Mohan took the Whittlesey AA honours on Bevills Leam with 9lb 12oz. He had three tench, two caught on the waggler and one on the pole. Runner-up was Mel Saggers with a 7lb 3oz net of roach, rudd and perch while 5lb 7oz was enough to give Mark Barron third place. He caught small fish on the whip.